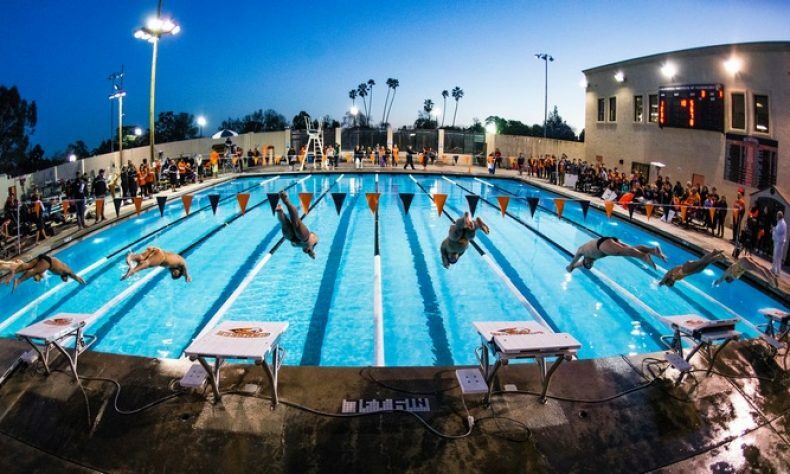 The Caltech men’s and women’s swimming & diving teams will enter the 2018-19 season with a key change at the top, but are looking to stay true to their past selves as they hope to meet their goals, which includes advancement up the SCIAC ranks while sending more swimmers to the NCAA Division III Championship meet at season’s end. Head Coach Andy Brabson enters his first season at the helm of the men’s and women’s teams following a successful five-year stint at Oberlin College and plans on applying his standards and expectations for training sessions without compromising the factors that caused the men’s team to score more points at last year’s SCIAC Championships than ever before, or what led the women’s team to its best-ever finish at the conference meet. Last year, the Beavers sent junior Thomas Gallup (Houston, Texas / Phillips Exeter Academy) of the men’s team and senior Brittany Percin of the women’s team to the national meet in Indianapolis. As a freshman, Gallup scored the first points for Caltech at the national meet since 1983 before doing so again back in March. Percin, meanwhile became Caltech’s first female national meet representative since Sue Rosick in 1983 back when swim & dive was an NAIA program. Both teams will be undoubtedly hungry for more success and 2019 could provide an opportunity to send even more competitors to Indy. Thus far, the buy-in under Brabson’s leadership has been such to where both teams could pick up right where they left off this past season. The women’s team will be led by its two captains in Percin and classmate Gemma Takahashi (San Jose, Calif. / Leland), two of the most prominent swimmers in program history. While Percin is coming of SCIAC Championship second-place finishes in the 200 Fly and 200 Free, Takahashi won took first place in the 100 Fly, and will look to defend her crown in 2019 while potentially punching a ticket to the national meet before graduation. Other returners, such as sophomores Jessica Sun (York, Penn. / Red Lion Area Senior) and Stella Wang (Greensboro, N.C. / North Carolina School of Science and Mathematics), in addition to senior Teresa Tran (Irvine, Calif. / Northwood) will also play an important role if the women are to improve their conference standing at SCIAC’s. Sun became the owner of three individual records in her rookie year and even won the 400 IM ‘B’ final at SCIAC’s last year. Both have the versatility to make impacts in the relay events as well, and could mix in with some key players from the incoming class. Freshman Isabel Swafford (Boise, Id. / Boise) and graduate student Danica Adams (Novato, Calif. / UC Berkeley) should immediately make the women’s team better, with Swafford being an early practice standout and Adams having competed with Terrapins Swim Club while at University of California Berkeley. Other first-year swimmers will include Virginia 2A record holder Isabella Dula (Tuscaloosa, Ala. / Maggie L. Walker), freestyle specialists Olivia Grobowsky (Houston, Texas / Westside) and Teresa Riedel (Adamstown, Md. / Homeschool), women’s water polo recruit Yuying Lin, and well-rounded Serena Yan, rounding out the largest women’s roster since 2010-11. The diving component will also be a strength of the women’s team, as sophomores Krystin Brown (Lake Forest, Calif. / Trabuco Hills) and Nerys Huffman (Broomfield, Colo. / Peak to Peak Charter School) will return for their second year. Brown, who entered her rookie season with no high school diving experience (albeit with a background in gymnastics), came less than two points away from qualifying for the regional diving championships. Huffman is also coming off a strong rookie campaign and the duo will once again be joined by junior Alix Espino (El Paso, Texas / El Paso) and converted swimmer sophomore Olivia Durrett (Charlotte, NC / Phillips Academy Andover). The men’s team is coming off its second-consecutive sixth-place finish and while Gallup will be an integral part of the Beavers’ quest to move into the conference’s top-five teams, the men’s team is returning several swimmers with the talent and work ethic to realize their own lofty goals and aspirations. Senior Henry Steiner (Petaluma, Calif. / Casa Grande) will captain this year’s men’s team and currently holds both Fly records. Sophomore Alex Janosi (Ann Arbor, Mich. / Dexter) returns to the team following another successful water polo campaign and will be gunning for the men’s 50 and 100 Free records to add to his 200 IM record. Sophomore Andy Rothstein (Potomac, Md. / Winston Churchill), like Janosi will join the Beavers after the water polo season ends this weekend and will look to expand on a solid rookie season when he found the podium as a member of the 200 medley relay team. Another multi-sport athlete joining the team on the heels of a successful fall is sophomore JD Walker (Grand Blanc, Mich. / Grand Blanc). A fixture on the men’s soccer team, Walker will once again contribute in freestyle and relay events. Classmate Adam Kogan (Clifton Park, N.Y. / Shenendehowa East) is also coming off a dominant rookie season that saw him become the program’s distance free champion in short order. While the men’s team will leave behind some holes originally filled by current record holders, a rock solid freshman class awaits Brabson and his staff. Each of the newcomers possess the right combination of talent and work ethic that could prove vital towards the Beavers’ hope of advancement later this year. Freshmen Nick Jasinski (Crystal Lake, Ill. / Crystal Lake Central) and Timothy Yao (Thousand Oaks, Calif. / Dougherty Valley) have each stood out considerably at practice, with Jasinski providing versatility in the 200 back, fly and distance events and Yao profiling as a sprinting specialist. Additionally, 6-foot-6 Thomas Barrett (Chatham, N.J. / Chatham) has the potential to see his times drop as the season progresses, and breaststrokers Jeffrey Ma (San Jose, Calif. / Bellarmine College Prep) and Happy Chang (Shenzhen, China / Wilbraham and Monson), along with senior Adam Dai (Santa Barbara, Calif. / Dos Pueblos) will provide breaststroke depth behind Gallup and have the opportunity to score meaningful points at SCIAC’s in 2019. The incoming crop of new talent will also be made up of Venice High School valedictorian Colin Chun (Los Angeles, Calif. / Venice), freshman water polo players Austin Harvard (Lake Forest, Calif. / El Toro) and Alex Wang (Saratoga, Calif. / The Harker School), junior teammate Bradley Justice (El Cajon, Calif. / Grossmont) and freshman Rafael Santiago (Manila, Philippines / Phillipine Science). Returners such as junior Ayan Bandyopadhyay (San Jose, Calif. / Bellarmine College Prep), sophomore Jethin Gowda and senior James Deacon (Santa Barbara, Calif. / Home School), voted last year’s most inspirational swimmer, will all be looking to lower their top times and provide their teammates with the needed spark to put them over the edge. With Brabson taking the reigns as the Beavers’ third coach in the last four years, very little is expected to change. Expectations have risen, but the goals and procedures remain very similar to years past. Now, Caltech boasts one of its most mature and motivated squads to date. This, when combined with an increased attention to detail in practice could have this year’s Beavers poised to reach new heights sooner rather than later. Brabson and the Beavers will begin the 2018-19 season on Saturday, Nov. 10 at home against Cal Lutheran at 10 a.m.